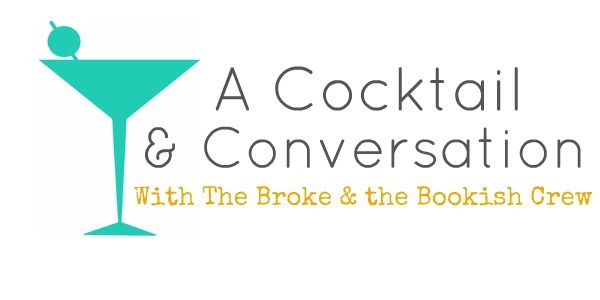 Every Wednesday here at the Broke & The Bookish is going to be A Cocktail & Conversation time. We'll pose a question to 2-3 members of TB&TB crew about books, life, music, etc and then they'll answer and we can converse about it. So grab a cocktail & cozy up for some conversation. It's 5 o'clock somewhere, friends. This week: What is one book series that you think more people should read? Seriously, this is one of my favorite trilogies of all time, and I think it scares people because they assume that since it was published by a Christian book company (Shadow Mountain), that religion will be shoved down their throats. Let me just tell you now, there are no elements of Christianity or any other religion in this series at all, so you will not be preached to. I promise. The first book introduces us to a high school student named Abby, who is living a normal life with her boyfriend... until she meets Dante, a foreign exchange student from Italy. He's this swoonworthy, mysterious guy who is completely different from anyone else. Time changes when they are together, and as Abby gets to know him better, she learns of his mysteries, like how he worked for Leonardo Da Vinci as his apprentice and built a time machine before he was framed for treason and banished to another time--500 years into the future. Turns out Abby is also more special than she thought. The whole trilogy is a race through time, to save the present from colliding with the past. The writing is gorgeous, and I devoured each book in what felt like minutes. You really must read it! Not being much of a series reader, I have really struggled with this question. But I think that a series that made a huge impact on me when I was pretty young and not yet reading grown-up books was The American Girl Series, which presented girls around the ages of 9 or 10 who lived at various points in American history. Samantha was my absolute favorite, but there was also Felicity, Kirsten, Addy, and Molly. Then they added a few more that I haven't read, but I'm looking forward to having a daughter someday a few years from now so we can read the ones published later. My parents read these to me when I was younger. These books are fantastic. They present strong, resourceful characters who are good role models for girls. The stories provide a nice bit of cultural history and I have to credit them with starting my love of history at an early age. However, for a more adult flavor, I would highly recommend reading the entirety of the Ya-Ya Sisterhood series by Rebecca Wells--Little Altars Everywhere, Divine Secrets of the Ya-Ya Sisterhood, and Ya-Yas in Bloom. I think a lot of people really focus on Divine Secrets because that is the one that became a movie, however the first and third books are short stories that are told in the different characters' voices. They help provide a back-story for or an elaboration on what happens in the middle books. They explore the dynamics of female relationships as a cast of four quirky women grow up during the Depression, raise children during the 1950s and 1960s, and finally reach old age in the 1990s. I love it. So readers, what is one series you think more people should read? The floor is yours! Want to ask us a question for a future A Cocktail & Conversation? Fill out this form! First, I love this topic :) The Hourglass Door sounds like something I would love!! The Hourglass Door series definitely sounds like something I should read! And I LOVED the American Girl books when I was younger - Samantha was my favorite too! For younger readers, I loved The Saddle Club & The Magic Attic series. But now, as an older reader, I absolutely loved The Abhorsen Trilogy by Garth Nix, and The Inheritance Cycle by Christopher Paolini. I have two: The Song of the Lioness Quartet and the Pendragon Series. Both have been overlooked in the Harry Potter, Hunger Games, Twilight hubbub and are just as good as HP and HG (and significantly better than that other series that shall not be named again). Interesting question! The Hourglass Door series does sound like my kind of thing, I might check that out. I will have to check out The Hourglass Door Series! I have a few, all fantasy - Celine Kiernan's Moorehawke books, published a couple of years ago, are outstanding. They deal with tough issues, ask difficult questions, and really leave the reader thinking about whether her protagonists are doing the right thing or not. For younger readers, I've always thought The Dark Is Rising was the best ever series but a recent reread of The Chronicles of Prydain, by Lloyd Alexander, may have changed my mind - stunning character development over the five books, particularly for the main character Taran, and the last book is possibly the only fantasy novel ever to make me cry. Superb. I love the Stephanie Plum series. It's just fun reading. I have to do my bit for my country and say that everyone should try the Spud Trilogy by John van de Ruit. It chronicles the all-boys' boarding school mischief experienced by John Milton aka "Spud", in newly-democratic South Africa. The fourth book was published at the beginning of this month, and it's lovely (and funny). I am always late on these conversations but I really enjoy them. Plum series is fun. I agree with Angela! I'll be honest I typically recommend the Hunger Games to people. The recommendations above sound fun... I will be adding them to my list!